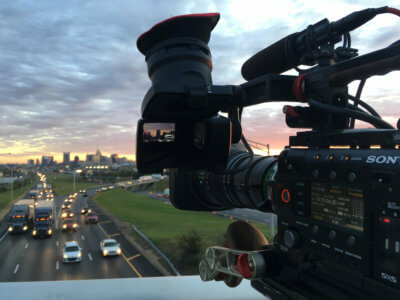 Everything you ever wanted to know about shooting video in Nashville. Prior to arriving in a new city, every producer needs the lay of the land. This guide explores everything about Nashville, TN that producers need to know. For years, Nashville has been dubbed “a drinking town with a music problem,” but whiskey and country tunes are just a small part of what makes this vibrant city tick. The Cumberland River slicing right through its epicenter provides ample opportunity for water outings – not to mention stunning skyline views. Downtown’s famed “Honky Tonk Row,” which runs down Broadway to the riverfront with additional live music venues spilling over onto Second Avenue, is where the bulk of the tourists gather, but there’s much more to Nashville than the bright lights of Lower Broad. See this iconic city’s gorgeous Classical and Neoclassical architecture. Its culinary scene – which extends far beyond fried food – is making waves not just on a national level, but globally, too. And Nashville boasts some of the best music you’ll find anywhere. With Nashville being the upbeat city it is, there are events occurring year round. Live music is going to be the most popular and most accessible since Nashville is known to be the city for the newest artists performing in little cafes and bars. Honky Tonk Road and Lower Broad are the hottest spots to catch some tunes. The Ryman Auditorium is known to be the “mother church for country” as it hosts one of the most popular shows “The Grand Ol’ Opry.” For some outdoor fun, the Cheekwood Botanical Garden is full of beautiful scenery and architecture along with a visit to the infamous Great Smoky Mountains. Hiking and biking trails are located all over the mountains, just be aware of tourist seasons since it is known to bring close to ten million people every year. Several distilleries are located throughout Nashville; it’s most popular include the Nelson’s Green Brier and the Corsair. The Country Music Hall of Fame is a popular spot for visitors to explore especially since it holds as a shrine to Johnny Cash and Dolly Parton, some of Nashville’s most popular music artists. Try some “hot chicken” at local spots such as Hot Chicken Shack or Hattie B’s. Nashville is one of those cities where almost any restaurant or bar you step into, you’re going to get a show whether it be the performance of the food or the performance of aspiring artists. For sports, Nashville plays home to a few professional teams including the NFL team the Tennessee Titans, the NHL team the Nashville Predators, and the soccer team the Nashville SC. Nashville offers plenty of options for higher education including Vanderbilt University, Tennessee State, Belmont University, and Nashville State Community College. Nashville has great hotels located all throughout the city for a great price. Of course, be aware of tourist season since hotels can be known to raise their prices but overall, their hotels are in great locations for decent prices. Some include The Inn at Opryland, the Courtyard by Marriott Nashville Airport, Millennium Maxwell House, and Hilton Garden Inn Nashville Vanderbilt. Nashville has become increasingly crowded over the years so traffic has become more of an issue but locals and tourists still use personal transportation to get around the city. Car services like Uber and Lyft are popular amongst people as well as a fun and new service called “Joy Ride” where a golf cart service gives people ride around the city. The Nashville Airport is located 15 minutes outside of the city, Memphis is about three hours, and Knoxville is about two hours and 45 minutes from the city. Nashville, just like any southern city, has a humid subtropical climate, but its altitude prevents the weather from being unbearable. July is their hottest month standing at 89 degrees, and January is their coldest month standing at 47 degrees. It can get pretty chilly during the winter but snow is unlikely. The spring and fall are the best times to visit since the humidity is low but you won’t need a jacket quite yet. Click HERE for a current 10-day forecast of Nashville, TN. Crews across the country have a set of guidelines by which they conduct business. And as different as each city is from another, so are those guidelines. Every producer should have a basic understanding of each city’s standards. Shoots in Nashville are based on a ten hour day and the crew is on the clock at the specified crew call. Overtime at a rate of time and a half begins after ten hours. If your shoot takes the crew to a distant location, travel time can be expected. A distant location is any location outside a circle with a 30-mile radius drawn around the city where Downtown is the center. But all of these are just guidelines; certainly, verify with your crew their specific policies. If you have additional questions about Nashville you can always contact the city’s Chamber of Commerce.